It was my friend Gregg Burgess who started the examination of the relationship between soul music and the Vietnam War with his excellent groundbreaking article in "In The Basement" some years ago now. Ace UK followed this with the release of two CDs covering the same subject which drew heavily on Greg's work without any visible sign of acknowledgement. But all this has only scratched the surface of a very large subject. And while this is not the place to debate the war itself it is a fact that it had a large disproportionate effect on African Americans and their families. 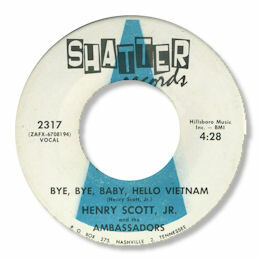 Part of the response to this pressure was a musical one and although the Ace CDs have brought into the public gaze some of the more obvious and successful soul songs there are plenty more to discover like this excellent one from Henry Scott Jr.
Judging by the address on the label this fine deep ballad was cut in Nashville on which Scott is suitably emotive on this saddest of topics assisted by a horn rich band featuring a strong tenor sax solo. The only downside is the percussion which sounds as though a horse unfortunately got loose in the studio during the recording. Many thanks to David Cole, editor of "In The Basement" (see Links) for the correction to a dreadful howler I made on this page which has now been corrected.